Many people wants to whiten their skin therefore, they are spending lot of money on skin whitening creams and products. Skin whitening creams and products are not meant for giving you a pearly white complexion overnight as they are advertised by many whitening companies. These types of products are used to reduce or inhibit the melanin production by suppressing the Tyrosinase Enzyme. Hydroquinone is well known for its melanin inhibiting and antioxidant properties. It inhibits the production of melanin therefore, works well in skin whitening. However, there are many side effects related with its use like Ochronosis. Mercury is also used as an active ingredient in many skin whitening creams. It is quite harmful and may cause Neurotoxic, Mental problems, Speech and Hearing impairment, Kidney problems and other health related disorders. Other harmful ingredients include Mineral Oils, Dioxane, Parabens, Alcohols and Fragrances. Try to choose Kojic Acid, Liquorice Extract, Azleaic Acid, extracts of Bearberry, Mulberry, White Mulberry and paper mulberry based skin lightening products. If you don’t want to take any risk then try using homemade skin whitening products rather than going for chemical based products. Mix 1 teaspoon of honey, one teaspoon of lemon juice, one teaspoon of milk powder and half teaspoon of Almond Oil. Apply this mixture on your body and leave it on for 15 minutes and wash off. Make a mixture by mixing Tomato Juice + Yogurt and Oatmeal, apply it to the body and rinsed off after 20 minutes. Grated Potato applied on the body helps reduce blemishes and other marks. 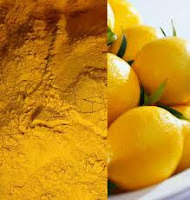 Make another mixture by combing Lime Juice with Turmeric Powder, apply it to the skin to get rid of hyper pigmentation.